It’s all very well having an electric car, but you’ll need somewhere to charge it. Here’s what you need to know about charging your car at your home. Find out more information on whether you should buy or lease the battery for your electric car. How far can you go in an electric car or plug-in hybrid, and what can affect your range? What different types of charging points, cable and connectors are there for electric cars and plug-in hybrids? UK startup Alcraft is crowdfunding to build the prototype of a new, low-volume electric car that could start production in 2019. 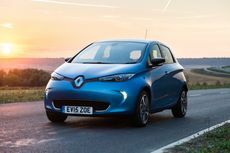 This is the latest version of the world's biggest-selling electric car, and it's set to go on sale early next year, with stronger performance and a longer range than the current car. We’re just two years away from our first chance to drive an all-electric Mini, and this new concept gives us a clear idea of what we can expect it to look like. Due to be seen in the flesh for the first time at the Frankfurt Motor Show, the revised i3 has a new look and some extra equipment, while buyers also have the option of a higher-performance version. Skoda's Vision E concept gives us the first glimpse of a production car that will rival the likes of the Tesla Model X and Jaguar I-Pace when it goes in sale in 2020. Kia claims the Niro is the world’s first ever hybrid crossover, but is that really enough to give it the edge over the Toyota Prius and more conventional crossovers?